If “Basic Story” edged right up to the prospect of this particular story needing to come to an end, “Basic Sandwich” beats a hasty retreat from that precipice before anybody gets the wrong idea. It’s as bland as that episode was strong, and it brings the season to a bit of a disappointing end, especially after both “Basic Story” and “G.I. Jeff” were willing to dig a little deeper and expose things the show’s fans might not always be into hearing about. It’s hard to hate “Basic Sandwich,” which has a relatively successful happy ending and one of the better tags of the season. But its big emotional climax also involves Jeff trying to trick an ancient computer into feeling intense passion because of his love for his friends, and it features Chris Elliott at his Chris Elliott-est. Neither of these is unworkable, but the whole thing sort of feels thrown together at the last minute so everybody can head out for summer break. There’s a part of me that sort of suspects this is meant to be the joke. Greendale is in such dire straits that the only thing that could possibly stop the sale of it to the Subway company would be something completely implausible and ridiculous, like a buried treasure map or the power of love or a man who’s been living underground for decades. It feels, if you squint, like the show is making fun of the sheer absurdity of the fact that it’s run this long and will, in all likelihood, run at least one season more (and then maybe a movie). And, as you’re probably aware, I’m always amenable to that sort of meta-commentary from the show, so I probably should have been here as well. But I just wasn’t going with it in this episode in a way that I normally might, and I think I know why. I also just never went along with the whole “there’s a lost computer lab hidden beneath Greendale, and the school’s founder is hiding out there with a computer he’s trying to get to feel emotions. Aside from the thought that this is sort of the show’s basic story in a nutshell—a bunch of computers figuring out how to feel things—it felt almost too wacky for the show, which is saying a lot for a series that just a couple of weeks ago came up with a really solid mid-life crisis episode disguised as a G.I. Joe parody. 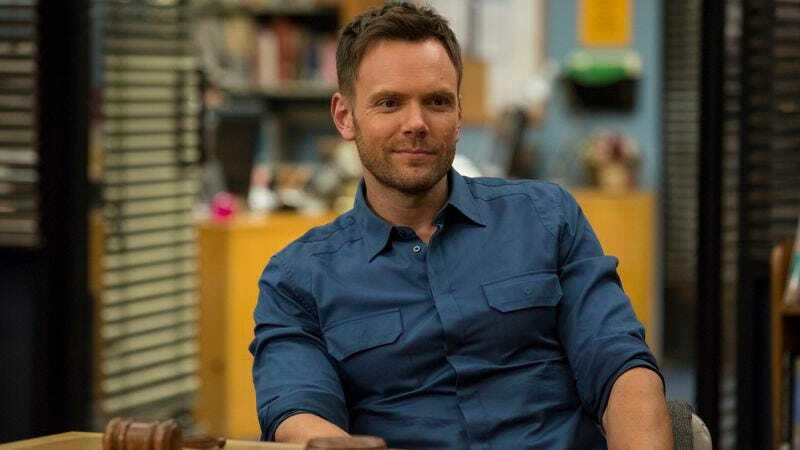 Community prides itself on having its goofiest stuff be based in some emotional core, and I don’t know that this ever once worked on that level, because the salvation of Greendale was always going to happen. It might have worked as a hidden origin story for the school—and I did like Greendale Computer-y College—but it felt like a lot of yelling and then Jeff feeling things. Which could describe a lot of the season, really. Plus, the story returned to the seemingly endless Jeff-Annie-Britta triangle. Where last week’s episode turned Jeff and Britta’s bizarre marriage plan into a comment on how we try to force meaning onto experiences we’ve had, this episode just got mired in the same old romantic tiredness the show has been stuck in for a long time now. The pleasures, then, came from things around the edges, like Abed explaining to Annie how Jeff and Britta aren’t going to spin off into some new show that will last only six episodes, or that insane bit when one of the School Board members attempted to burrow into Hickey’s brain to find out where the others had escaped to. (It doesn’t work, but Hickey was thinking about hang-gliders.) I also like the thought that Starburns just hangs out in the lunch room next to a boombox in case anybody needs “Ants Marching” played at a moment’s notice, and I thought there were some nice moments in the early going, when the whole ensemble was together and speaking over each other, particularly whenever John Oliver got a word in edgewise. Also good: Jeff and Britta calling off their marriage via Britta correcting him that, technically, the wedding was off. So how does season five stack up to the previous four? Saying it’s better than season four isn’t saying a whole lot, but it really was a marked improvement over that season (which wasn’t as bad as its reputation but definitely felt like it was off-brand in some creepy ways). It’s obviously not to the level of the first two seasons, but there’s no way it could be, given the fact that by season five of a show, we mostly know all of its tricks. I’d also put season three ahead of it slightly, because it felt like it had a stronger throughline, ultimately. But this is still far better than the fifth season of this show had any right to be, particularly after season four was so often such a mess. It brought the show back to a place where it felt like vital viewing every week, and on a few occasions, it cranked out episodes that can stand with the show’s best. If it had lost a bit of its old speed, that was inevitable. Even if this finale left a bit of a sour taste in my mouth, it was just nice to have a Community that felt like Community to watch every week. Here’s hoping season six keeps that momentum going—and brings everything to a gentle, graceful ending. Though I didn’t think much of his character, I’m sort of surprised Chris Elliott has never popped up on this show before, as he fits quite well within its universe even without a crazy old man beard. One thought: I’m not sure if the show ever completely recaptured the balance of things after the departure of Troy and the loss of Pierce. It tried valiantly with Hickey, who was a fun character, but it often felt like the show wasn’t sure how to operate without those two characters holding down one end of the study table. And since it seems unlikely either Hickey or Duncan will be a part of season six, it will be interesting to see what the show comes up with to fill that void all over again. Abed promising that the characters will be back next year is the sort of thing that could very easily backfire if this becomes the series finale somehow. But I really do think we’ll get one more year with these folks, thus pushing it into 100 Episodes territory. If the show is back, I think there’s more territory to be mined in the show’s history, even if Borchert felt like a false lead. I liked the idea of the school’s incredibly racist former mascot (which, incidentally, felt like a Parks gag). Doesn’t it feel like for an episode about saving Greendale, there was very little of Greendale in it? Not that I needed every other moment to be the show’s copious amounts of supporting players, but it might have helped land some of that emotional climax a little more. Also: Not having Shirley present for Jeff’s big emotional moment was a little strange, since she’s, y’know, one of the original group members, much more so than the Dean. We’ll see you next season—hopefully—and let’s hope we’ll all meet again in the fall, instead of the spring, because this show felt really weird without chances for Abed to celebrate specific holidays and other dates. Also, you didn’t even get close to 1,000,000 comments last summer, so you know what you have to do.